I wanted to tell collectors about one of the rare times we could buy Disney storybook art directly from Disney. Quite a few years ago, around the time Disney was deciding whether to keep having an art program or not, someone who had been working in and around Disney for many years contacted me about the likelihood of Disney Publishing opening up to sell art to galleries. Obviously, I was ecstatic! There are a lot of artists who created Disney storybook art that are great talents, and some of them are even legends now. Claude Coats, Retta Scott, Bill Peet…just to name a few! I had the great pleasure of selling a whole collection of illustrations for Retta Scott’s Cinderella book. It was for the puppet book, not the original storybook, but they were glorious and finding and placing it with a collector is one of my favorite memories as an art dealer. Regardless of the fact that whoever was building the program at Disney for illustration art sales wasn’t branding the art based on the artist, but rather the subject matter, I was still all in. I knew my clients would be thrilled. As a test to see whether there was interest, Disney was doing some low key selling of original Disney storybook illustrations on Ebay. This was back before Ebay had unintentionally created the garage sale feel they have now. I scoured the site for when they posted art. They only did it for a very brief time, and I knew about it from the beginning. 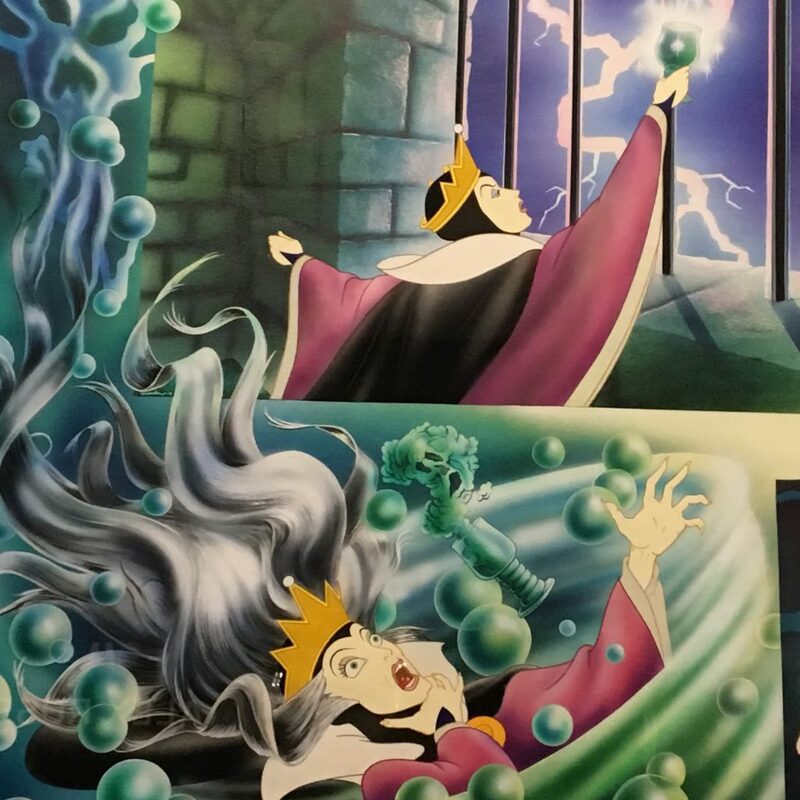 One of the images they placed on there was this original Disney publishing illustration from a storybook about Villains. You can see the space to the right where the words go. What is also great about illustration in general is that very rarely is there just one medium used. It might be drawn on illustration board, with gouache, but enhanced with airbrush, or pen and ink. Illustrators use whatever will solve their design problem or build the aesthetic they are after for that project. We bought the art from Ebay, and promptly sold it to a villains collector. Oddly, even then they didn’t know or weren’t willing to tell us who did the actual illustration. (Yet another reason I should have been working inside Disney…CREDIT, people…CREDIT!) Years later we were thrilled to be able to offer it again to another lover of illustration and villains, or rather misunderstood heroes. Sadly, the folks inside Disney publishing thought better of selling the art out of their archives. I do wish they’d lost their head and sold a bit more before coming to their senses! I remember my friend Lella, who used to be the head of the Disney archives, would bemoan the fact that the company sold so many backgrounds from their movies to the public through Sotheby’s. At least they DID. We were only able to get about three pieces before collectors got wind of what they were doing and then the prices often went above 10k. Lucky for us we knew about it at the beginning! 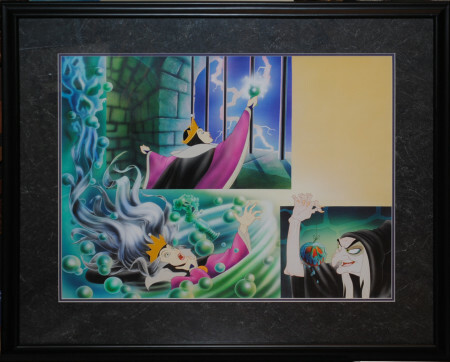 For collectors of Snow White and villains, this piece is particularly great, since it’s so prohibitively expensive to get both the Queen and the evil witch. Also, since the vast Snow White art collection owned by Steve Ison was sold back to Disney, finding original art representing the characters has gotten a lot harder and more expensive. I have seen cels of the moment of her transformation before, but they are very strange and also very expensive. Here’s a way to represent the darkness of the character, tell story, and celebrate wonderful illustrative talent at once.